Day 23. Thanks to piracetam, the slope of my score curve has increased, turning from a line into an upward curve. 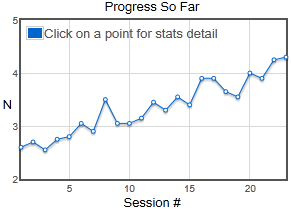 After 23 sessions, an upward curve emergesI'm apparently (could be temporary) improving faster. Piracetam works. Or maybe Alpha-GPC. Or both. Or ALCAR. Or 5-HTP. Or all combined. Or playing more than once a day, as with yesterday. Although, you would think that a break helps, as it seemed to have helped after returning from vacation. But, then, I started piracetam then, too. Whatever the cause or the case, this is good news, assuming the effect of playing MindSparke generalizes into everyday experience and boosts my productivity or speed. Actually, I'd settle for just a faster processor. I just hope I don't suffer the fate of Charlie in Flowers for Algernon. This is turning into a blog about piracetam. But if it works, maybe I've found the great ADD cure! Probably not. And to be fair, I'm also taking Acetyl-L-Carnitine (ALCAR) and 5-HTP. So, it will be interesting to see if not taking one or both of these changes the effect. I know that I don't want to stop taking Alpha-GPC while taking piracetam. Anyway, this morning, I took roughly half of the dose I took the first two times, so about 2 g. So far, I definitely feel more focused and interested in things, generally. I just found myself reading about ALCAR and, from there, other health supplements, and in detail with strong attention. That's unusual. I usually skim and care about much less. As I mentioned yesterday, although piracetam seems to increase concentration, it doesn't seem to do much of anything for motivation. Although, spending longer, and paying more attention to, a task is basically what motivation ensures. So, maybe if I can get started on being productive, I will be more productive than before! We shall see. I'm definitely noticing better concentration and easier comprehension. I feel brighter. This morning before work, I took the same dosage of piracetam, roughly 4,200 mg, with Alpha-GPC. Here is what I felt throughout the day. My MindSparke score is somewhat lower than yesterday, down to 3.7 from 3.9. I felt distracted throughout, but I did manage to finish all 20 blocks without interruption. And, although I felt distracted while trying to complete each block, it was in the sense that I felt more aware of other thoughts, if that makes sense, and not in the sense that I wanted to do something else, as is usually the case. So, I think my mind is more aware of itself but my impulsivity seems lower than usual. It's interesting to think about how I feel right now. I feel in "the zone" or more focused on each activity, but the feeling is mild. Or maybe it's profound and I just don't realize it yet. I'll drink my morning coffee and see how that affects me differently, if at all. The half-life of piracetam is 4-5 hours, so I have until noon to experiment. I guess this also means that, if it does help me focus, I'll need to take an afternoon dose as well. Today has been unproductive. I have had a slight headache off and on. I felt better after lunch, although very sleepy before grabbing my afternoon caffeine boost. So, lack of sleep is definitely catching up. Tomorrow morning, I will try half as much piracetam and I will bring another dose for the afternoon. My sense is that piracetam does not help with motivation but does encourage a "flow" state or sustained focus. Today, piracetam arrived from Amazon. I've tried it before, in 1999, along with Hydergine. I threw up Hydergine and felt nothing from piracetam. I don't recall how big of a dose of piracetam I took, but I do recall wondering if it might be a placebo or, in the best case, provide an undetected long-term cognitive benefit. I ordered it again to see if it helps with focus and motivation. I've read claims of both benefits. Piracetam is often called the first nootropic and is regarded as extremely safe with little or no side effects. Maybe it's sugar. If so, it's the worst-tasting sugar on the planet. Tonight, I took my first of two "attack" doses at around 4,200 mg. Tomorrow morning, unless I experience poor sleep, I'll take the same amount. Then, I should be able to take less, maybe half. I'm taking it with Alpha-GPC. I've seen this advised several times, since piracetam depletes choline and the combined effect is supposedly greater than when taking either alone. What have I felt so far? I took it around 9 pm and, about an hour later after eating something, I actually felt foggy, mostly in the sense that I felt myself visually zoning out while watching a show. Of course, I tend to do this when I'm tired, so I can't attribute it to piracetam, and the show isn't that interesting. I do have a slight headache. But, again, this could be from piracetam, Alpha-GPC, both together, dehydration, or a number of factors. As for cognitive benefit, I'm sitting here wondering if I would normally write this long of a post at 11:49 pm. If I feel tired, it's only slightly. And I slept around 1 am last night, getting a little over 5 hours of sleep, so I would expect to be dozing off right now. So, maybe piracetam, Alpha-GPC, or both together are reducing drowsiness. If so, great! Although, I do love sleep. And I do wonder if choline has a natural cycle in the brain (e.g., less or more at night) and if I shouldn't take it at night. I also definitely feel calm and focused. I recall reading that piracetam is a derivative of GABA and people take GABA for stress, so maybe piracetam provides a nice calm feeling. If so, I might take it for that reason, alone, given the other potential benefits. It would be like Super GABA. In any case, I'll sleep now and see how I feel in the morning. Hopefully, bright-eyed!